I dont want to brag or anything, but Ive made a lot of money online. With a little bit of help, I pretty much taught myself Internet Marketing and Ive been making money online ever since. Sound surprised? Well, you shouldnt be. Internet Marketing isnt difficult to learn and it isnt difficult to do correctly. I learned it out of necessity, which they say is the mother of all inventions. As soon as I got to college, I realized that I was going to need more money than what my parents could afford to survive. With all the drinking, dating, socializing, eating and school books that were necessary, I knew that I needed to supplement my income. I knew I needed a job, but I didnt want to spend my time flipping burgers or working retail. My schedule was too busy for those types of jobs anyway. I knew I could make the money I needed online, I only needed to learn how. I actually assumed that I didnt even need to know exactly how things worked online to make money. I figured that if everyone else was making money online, that I could figure it out on my own. Internet Marketing Starts Here serves to deliver a product which, as the author himself states, operates on the premise that the reader is an internet marketer starting with a blank page. From there, this nifty eBook goes on to hand-hold new marketers through the all important process of keyword research, establishing a web presence using a variety of models, and of course...how to use those established techniques to monetize your business. What I liked about this eBook is the straight shooting approach it offers to the practice of internet marketing, and the emphasis of treating it like a business rather than a hobby. Its a lesson many us take far too long to learn. Wow! This was the eBook I was going to write, once I figured everything out about using the internet to develop a business! I was getting so tired of reading techniques from other gurus where all they said was get a website, but, as a newbie, how do you get or build a website? You answered that question and much, much more, simply and completely. This is a must have, buy before any other eBook for someone new to internet marketing!! I knew that there were dozens of Internet Marketing guides available, but I thought that I knew too much to waste my money buying a product that probably wouldnt teach me much of anything. I never gave the guarantee any thought either. It never occurred to me that if I bought the book and it didnt end up teaching me anything, that I could just return it for a full refund. After two months of not making any money online, I had no choice. I had to buy a product or I would have had to stop enjoying my college lifestyle and start working somewhere that I would hate. As much as you probably hate your job, theres no hate quite like slaving over a hot deep fryer while your friends are enjoying their college life. I knew that failure wasnt an option. I wasnt going to be scared off though. As soon as I returned the first eBook, I bought a second. The second book was slightly better than the first, but still not great. I returned that book too. The third book I bought was better than the second, so I didnt return it, but the fourth was worse than the first. The fifth book was the best of all, but it still wasnt great. The sixth and seventh were ok, but the eight is really where I found some great information. After a couple of days of reading and taking notes (a skill I had just learnt thanks to my college education), I had a fairly good idea of how to make money online, so I decided to start putting my new found knowledge to use. My online business didnt go quite as smoothly as Id love you to believe, but things ended up working out alright. The eBooks I bought were good enough to give me a basic idea of how things worked, but I had to figure out the nuances and the details on my own. Once I figured those details out though, things started booming. It seemed with every new month, my business seemed to double until one day it started tripling. After that, things just sort of took off on their own. Let me start off by saying that you know your stuff. Front to back, top to bottom. And he shows that in his new eBook. If youre looking for general marketing principles and vague concepts, look elsewhere. But if you need the real deal in a step-by-step, hand holding guide - this is it. No shred of information is left out. Ive used many of the techniques you suggest. And they really do work. If I had this guide when I got started a couple years ago, Id probably be making a lot more money by now. Do yourself a favor: reach into your wallet and spend your final dollars on make money eBooks. After this one, you wont need anything else. I have studied IM for years and I try to find simple step-by-step guides that tells me what to do and why. When I read Internet Marketing Starts Here I learnt much more in 1 hour than in 2 years searching on the web. Now I can save my time and money, and just start doing, because now I know what to do and why. Thank you! It was only a month ago, on the anniversary of this story, did I start to think back about how I got started. I realize now what I didnt realize then, that there is a serious lack of quality introductory eBooks for Internet Marketing. All I can say is WOW! You did a fantastic job on your eBook. I am a newbie and one of the most frustrating things about getting started, especially when buying reports or how to guides, is all the information that is left out. They give you a basic outline, but it is up to you to fill in the blanks. Your report is jammed packed with information. and no fluff. I like how you demonstrate how you can get started with free resources, and walk the reader through step by step from finding a product, to publishing it on the web. One thing I was very impressed with is how you discussed Squidoo, and hubpages. I do not think I have seen a report go into as much detail as you have. Because of that, I think that makes other peoples reports seem dated. Once again great job and good luck. Internet Marketing isnt a natural science, you dont need to go to school for years to make money. You dont need to learn by example or take an internship at a successful firm. The only thing you need to do to make money consistently is find someone to point you in the right direction. Online Marketing is very logical. If you stop to think about what youre doing, making money online makes sense. Nevertheless, there is a right way and a wrong way to do it. You can figure it out on your own, but unless you get very lucky and figure it out the first time, the learning curve can be a very long and expensive process. Let me cut through the process and show you how to do things correctly right now. Like I said before, there are hundreds, if not thousands of eBooks dedicated to teaching you how to make money online. With so many options, how can you know which eBooks are worth their weight in gold and which arent even worth the paper they could be printed out on? All I can say is Thank you, finally someone speaks the truth about making money online. As a beginner in this game I found that I had to sort through all sorts of hype and fluff only to find vague and incomplete instructions on how to get started. This book has everything a beginner needs. There is no hype or fluff only a solid, actionable plan spelled out step by step for you to follow. It is so refreshing to find a guide to making money online that doesnt just gloss over the information you need and leave you hanging, wondering what to do next. What I find useful is that every step that you need to take is covered in detail with screen shots included where necessary and the book is written from a totally realistic point of view. Nowhere will you find a secret magic formula that the so called gurus like to pedal. This is exactly the sort of guide I needed to point me in the right direction to earning the first of many paychecks from my online business! Only with the Internet Marketing Starts Here can you properly learn the methods that are guaranteed to teach you how to make money quickly and easily. Ive read every single how-to guide I could find and not one has as much information packed into one book as Internet Marketing Starts Here does. If you still have hair on your head, dont pull it out learning something that I can teach you in just a couple of hours. Internet Marketing Starts Here will teach you everything you need to know about Internet Marketing without confusing you or talking over your head. Even if youve never used PayPal or if you know absolutely nothing about building a website, you can make money in a very short period of time. If after reading this eBook, you dont feel like youve learned enough about Internet Marketing to start your own online business, just ask me politely and Ill return the money youve given me for this book. I know how important it is to feel confident in making a purchase online, so all purchases may be refunded within 30 days of purchase. If you dont think your new eBook wont teach you all you need to know about making money online, you can get your money back and Ill continue teaching everyone else these powerful methods. Internet Marketing Starts Here has already helped hundreds of people make oodles of money online. Let it help you too. Buy Internet Marketing Starts Here right now and start living a better life. Yes! 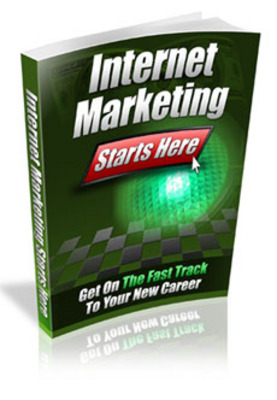 Im ready to start learning how to make money online with Internet Marketing Starts Here! I understand that by placing my secure order today, I will be getting instant access to this powerful eBook that is capable of teaching me what no other book online can! Internet Marketing Starts Here For Only $25.00!